The tradition of Chanukah food has its origins in the early years began to celebrate the holiday, and remind us some miracles associated with the events of Chanukah . The connection between olive oil and Chanukah: Most of us are familiar with the miracle of the oil, a bottle of oil that is supposed lasted one day, lasted eight. And we all know that this is the origin of the mitzvah of lighting the menorah for eight days. It is also the reason why it is customary to eat food cooked in oil. Potato pancakes, fried, of course in a lot of oil. Donuts stuffed with cheese, fried in oil and covered with honey. Chanukah, like most Jewish holidays, invites you to spend time with family, sharing nice moments and enjoying the preparation of traditional foods. As always, from Taim we want to share with you some of our recipes. For this occasion we have chosen the traditional Sufganiot. Mix all ingredients and let rise. 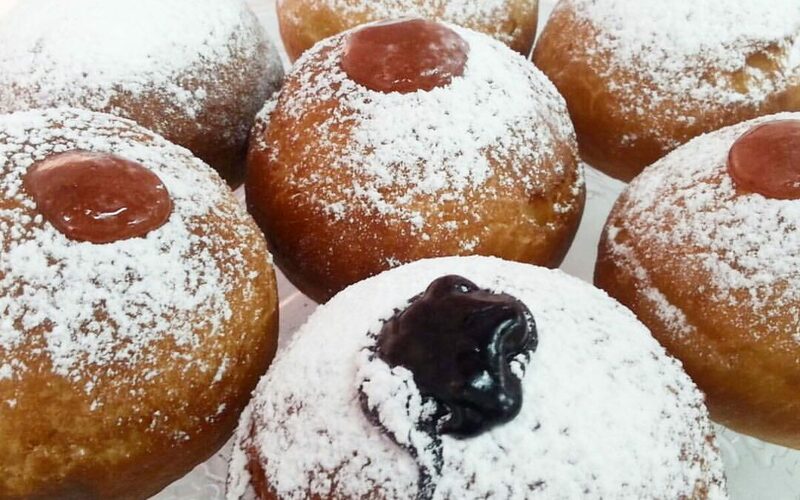 Sufganiot form and let leaven. Fry in oil at medium heat, first on one side until golden brown, flip and repeat. Filled with strawberry jam, chocolate, Nutella. Finally, sprinkle with sugar glass.